Come to see her who destroys, devastates, makes one plunge into madness! Tears happiness, takes one’s property, ruins the reputation, stains one’s honor, pushes society into chaos. She is here: Carmen! The internationally awarded stage performances by Compañía Kaari & Roni Martin are known for their absurd aesthetics. The ensemble’s premiere work KILL Carmen is simultaneously crude and cruel, alluring and twisted. Led by Roni Martin, the orchestra masterfully combines funk, flamenco and Balkan influences. Spanish dancers Mariana Collado and Carlos Chamorro erupt into the Pannuhalli performance space in the Cable Factory, all the way laughing right in the face of death. Helsinki Festival is the co-producer of the performance. The power duo of contemporary flamenco, Kaari and Roni Martin, has brought the world-famous Carmen to today's audiences with vehemence. This fresh interdisciplinary interpretation of the story, staged in so many adaptations, draws its inspiration directly from Carmen – the novella by the French author Prosper Mérimée, published in 1845 – and from carnivalistic flirtation with death. In the original story, Don José falls head over heels in love with Carmen and turns from a soldier into a bandit, ending up killing Carmen, who refuses to let go of her freedom. In Compañia Kaari & Roni Martin's Kill Carmen, the brazen gypsy is killed within minutes from the start – and another ten times more before the performance is over. The nine musicians taking the role of Don José in turns interpret the tragic character's experiences and visions of how the desperate love story, riddled with jealousy, could have ended. Death is defied, practiced, laughed at and taken by the hand without hesitation. The star of the night is Carmen, of course. The Spanish flamenco dancer Mariana Collado performs a fantastically nuanced dance, her flirtatious movements turning fierce at times, and she manages to recreate Mérimée's character more in tune with the 21st century. Kaari Martin's flamenco choreographies are unique and open to new influences, whether she is dealing with story-based interpretations or dance solos. Collado and Carlos Chamorro in the role of the young matador engage in powerful flamenco that seamlessly flows into a formidable modern dance expression. The performance is not without brisk humour, which is partly created by engaging a few viewers in the story. The music is mainly composed by Roni Martin, and it skilfully combines flamenco, funk and Balkan rhythms. The Finnish folk song On neidolla punapaula is deliciously mixed with tunes of traditional flamenco in the safe hands of Juan Antonio Suárez Cano (guitar), Alfredo Santos (vocals), Pablo Suárez (piano), Henrik Perelló (violin), Karo Sampela (percussion), Erno Haukkala, Samppa Leino and Antero Priha (wind section) and Roni Martin (vocals, electric guitar). Atro Kahiluoto's absurdly surprising dramaturgy, Erika Turunen's brilliant costumes and Ville Virtanen's atmospheric lighting ensure that the performance never stops. The modern Carmen is an enchanting and entertaining performance full of detail yet it manages to sum up the novella in one verse: "We never lived until we died." Compañía Kaari & Roni Martin has a phenomenal ability to recreate an artistic universe of their own from the impressions of a classic story. What seems to allow them to achieve this is an in-depth knowledge of tradition, an unfailing understanding of history, great technical skills and creative approach. KILL Carmen faithfully follows the spirit of Prosper Merimée's novella Carmen (1848), but the music, choreography and script cleverly strip the character of the heavy train of tradition. The novella tells the story of the gypsy woman from the French archaeologist's colonial perspective. This orientalist fantasy about a seductive and dangerous woman is more about its performer than its subject. In the many adaptations of Carmen, the femme fatale character also reflects the political forces of the day. It was penned in an era when a woman enjoying freedom could barely be anything but an outlaw thief, prostitute or murderer. In a later adaptation she was also portrayed as a freedom fighter for the women's cause. The way that KILL Carmen manages to break the wild and brutal image of the woman is ingenious; the matador is portrayed as a male equivalent of Carmen. The man and woman are equal in their passionate madness, narcissistic desire and disastrous love. The performance also challenges the original work's colonial heritage by engaging various cultural influences and expressions in the dialogue. Mariana Collado is a soulful and beautiful, horrifying Carmen with suggestive powers, and Carlos Chamorro is equally splendid as the bullfighter. The dancers outline stereotypes of gender, sexuality and ethnicity with expressive movements, thus redefining these stereotypes. The mastery and combination of the techniques of flamenco, ballet and modern dance and the limitless scale of emotions ensure that the performance is highly charged. In the true Tarantino-esque spirit of the title, attempts on Carmen's life are made again and again. At the moments when the beloved femme fatale is supposed to die, we hear the Habanera aria from Georges Bizet's Carmen as if a gently humorous tribute to the Carmen canon. Perhaps this could also be seen as a 'murder', a classic work when restaged needs a contemporary interpretation. This is brilliantly done by Roni Martin's music with its numerous influences ranging from funk to Balkan melodies, the lyrics' fluent movement between languages and Kaari Martin's impressive choreography. In this flamenco drama, the love-struck Don José is played by the nine top musicians, whose voices and instruments join the dance just as much as the dancers' bodies become rhythmical instruments. The perfect match of music and dance is a real love story. One could sense it, even almost touch it, even if there was no theatre smoke floating above the stage. From the very first moment, as the dancers and musicians show the audience to their seats flirting at the same time, the former boiler plant in the Caple Factory is filled with strong emotions, life and death. Kill Carmen by Compañia Kaari ja Roni Martin was premiered in the Helsinki Festival in 2015. It is an amazingly intense description of love and passion intertwined with no spare seconds in the production. The work is based on the original short story Carmen by Prosper Mérimée. As the title already reveals the story, death can be approached also in a playful manner. Carmen refuses to give an inch of her freedom, defiant will or feelings and dies over and over again by the hands of the jealous Don José, always rising back to life. The symbolic message is obvious: these women and the emotions they evoke will never disappear. One can tell that the group of performers from Finland and Spain has worked together for a long time. The different musical background of the musicians ranging from classical music to flamenco make a perfect blend, and the orchestra’s interpretation of Roni Martin’s versatile music, that takes influence from funk, flamenco, and Balkan music, is thrilling. The orchestra, conducted by Martin, does but play, they also act as Don Josés. Kaari Martin is a noted choreographer for contemporary flamenco. While her dance clearly grounds from the forms of flamenco, her movement and expression bring also much more to the performance. In the production, everything wraps around Carmen. The Spanish Mariana Collado is set to meet the challenge as the center of attention, the dignified man eater, who has a raging thirst for life, and who knows the price but chooses not to care. Opposite to Carmen, the Matador performed by Spaniard Carlos Chamorro appears somewhat pale in the beginning. The impression changes, however, latest at the point when Chamorro performs his solos showing his strictly controlled and fierce talent. The same intensity and glory can also be seen in Collado, both in her solo numbers and duets with Chamorro. Kill Carmen impresses the audience also visually. The costumes designed by Erika Turunen are dark and fateful but have a glimpse of humour and joy, and surprising details, as one can expect from Turunen. The stage lighting by Ville Virtanen complements the atmosphere without stealing the show. Atro Kahiluoto’s dramaturgy gives the final touch to the intense performance that nearly takes the breath away. Expectations were high prior to Compañía Kaari & Roni Martin's first performance last Friday. There had been talk of a Carmen project for years, and finally it was time for it to come to fruition. Meanwhile, the group has reaped rewards in a choreography competition in Madrid, as well as managed to promisingly broaden its audience in their home country. The starting point has always been flamenco, the language that choreographer Kaari and composer Roni Martin start their conversations with. But the group is now more concerned with performing arts, so forget the flamenco clichés usually associated with their work. Kill Carmen has all the exoticism of a slap round the face – here you'll find Quentin Tarantino is a source of inspiration. Despite this, the power of the show intensifies in the areas where traditional, dynamic, rich flamenco gets to shine. This does not mean that you have to stick to mere tradition, not at all! But tradition is still a great source to draw from. Kill Carmen is the most mature large piece that Compañía Kaari & Roni Martin has ever presented. It took quite a while to come together, and whilst this was going on, a pure dream team was assembled. This time, Kaari Martin has chosen to not be on stage herself, but pull the strings backstage together with dramatist Atro Kahiluoto – which seems to be a clever move; the dramaturgy has been chiselled out with a steady hand. It's actually rather fragmentary, but seeing as everyone knows the story, it is acceptable to freely wander away from it and come back to it. The only thing I have to say from a drama point of view is that the dancers' big solo comes way too late, more as a farewell than an introduction of the characters. Kill Carmen has two dancers and nine musicians on stage, and a large proportion of the show is about their stage presence. Occasionally it feels a little wasteful of resources, especially in the case of Pablo Suárez – one of the world's most gifted flamenco pianists, who doesn't have many notes to even play! And of course we would've liked to hear more of the great flamenco guitarist Juan Antonio Suárez 'Cano'. The musicians were also certainly scenic; here special mention goes to Henrik Perelló (violin) and Antero Priha (trumpet) in particular. Both gave sterling performances, both as musicians and actors. 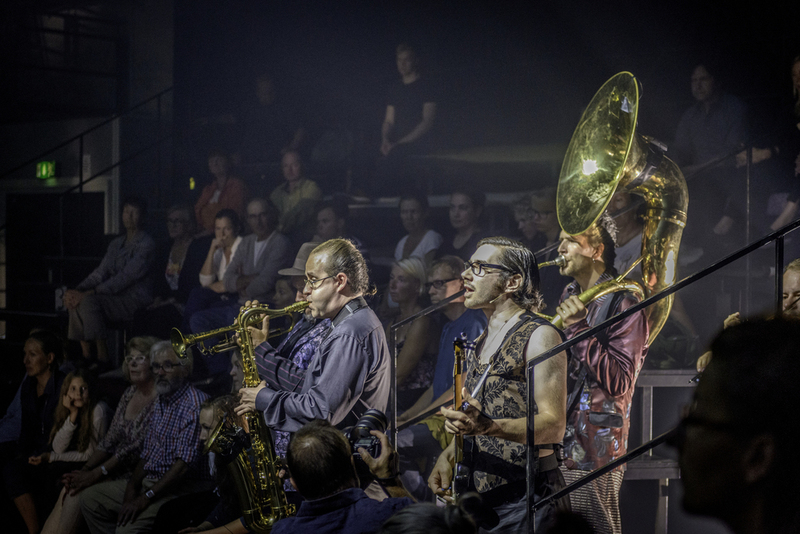 Erno Haukkala (bassoon, sousaphone) was also cleverly used scenically, while Samppa Leino (saxophone, sousaphone) was less visible. Flamenco singer Alfredo Santos was a new face in Martin's line-up, showing himself to have a rich and beautiful voice. However, he was a little unsure of himself scenically, but did have the evening's most striking death scene! Karo Sampela was, as usual, perfectly assured on percussion, with a balaphone as a new ingredient. The effect is excellent, even if when combined with the vocals, it felt slightly challenging. Roni Martin (vocals, electric guitar) has definitely found his place as a mastermind in a greater context. This time, some particularly captivating Balkan influences occupy a prominent position in his music. Almost all the music is characterised by an urgent drive forwards, also indicated by having chosen flamenco genres with the same properties, such as soleá por bulerias and siguiriyas. If there is anything that suffers with this aesthetic it is perhaps the rhythmic diversity and the relaxed swing. The rhythm sometimes felt pushed quite hard, only to then be released to flow in a relaxed manner. This is partly also linked to the fact that flamenco rhythms represent the 'mother tongue' of only half of the band. No one had any rhythm problems, but then again it is easier to keep the rhythms together than to unleash them. As for the dancers, Kaari Martin has found two kindred spirits in Spaniards Mariana Collado and Carlos Chamorro, who also contributed to the choreography. Both are strong, slightly odd personalities, like foreign birds in a flamenco Spain, who then found a home in this context of music. Chamorro was a definite for the dancing aspect, but the character of Toreador was a little unclear. He was at his strongest when he could do what he does best – dance! His fragility and depth perhaps did not quite come out fully. To include a dressing scene felt like a sympathetic homage to many other flamenco works with a bullfighting theme – not least Antonio Canale's legendary Torero. You make or break Kill Carmen with the title role, and you can't imagine a better, totally cheeky Carmen than Mariana Collado! She owns the show from start to finish, with a feisty temperament, stage charisma that few others can boast, and just the right amount of madness shining in her eyes. Dance-wise, Collado got something to get her teeth into in terms of moving around on many levels (compared to traditional flamenco which is often danced in a steady upright position), but I would have been happy if the really big dance solo had come earlier. Personally, I have a hard time with the choice of dress (or rather the lack of it) - the message would have probably got through in other ways. Mariana Collado in the title role was without doubt the shining star of the evening, in a well-balanced show that can definitely be counted as one of the season's major performing arts events. This Carmen won everyone over, as long as you weren't afraid of her strength. This Carmen definitely slaps you in the face! The flamenco is as inextricably linked with Andalusia as the legendary Carmen – the eponymous heroine of Prosper Mérimée’s 1847 novella, who – of all her multifaceted incarnations – is most famously immortalised the world over by Georges Bizet’s classic opera. Add the daring magic of acclaimed Finnish and Spanish musicians, dancers and flamenco choreographers to the mix and this latest take on Carmen becomes an extraordinary fusion of music and conceptualisation that doesn’t disappoint. Accompanied by no fewer than nine musicians – Erno Haukkala on trombone and sousaphone, Samppa Leino on saxophone, trumpet and sousaphone, Antero Priha on trumpet, Alfredo Santos on vocals, Juan Antonio Suárez “Cano” on flamenco guitar, Roni Martin on vocals and electric guitar, Henrik Perelló on violin, Karo Sampela on percussion and drums, and Pablo Suárez on piano – Mariana Collado and Carlos Chamorro starred as Carmen and the bullfighter in a one-hour performance with such brilliance, esprit, irony and sincerity that the audience could scarcely contain itself as it leapt to its feet for a standing ovation. “We wanted to play around a little with the image of Carmen,” explained artistic directors Kaari and Roni Martin. And indeed, with each member of the band also playing Carmen’s killer Don José, the Martins’ innovative idea to give the musicians a dual role puts them right at the heart of the action, adding balance to the stage and contributing massively to the performance as a whole. Energy levels were high and this successful symmetry packed a punch in every respect – quite literally even, as Don José doesn’t waste any time killing off Carmen over and over again, around ten or eleven times in fact by the end. With its combination of funk, flamenco, rock and Balkan influences, Roni Martin’s original music works in perfect harmony with the sheer expressiveness of Collado and Chamorro’s dancing and their interplay with the band, ensuring the emotions of love, passion, jealousy and even death are always at the forefront of the scene. Even the minimalistic costumes create maximum impact, as the musicians take to the stage all in black while Carmen wears just a bra and a flowing black skirt complete with two sewn-on frills in a subtle nod to traditional flamenco style. In fact, the only character to don a colourful costume is the mysterious torero, who also ends up dead over and over again in a role that isn’t entirely clear. It is this witty creativity along with clever takes and spins on the original story that lend Kill Carmen a certain irony and nonchalance. Even the music has a tremendous role to play in this regard: a Finnish folk song takes on a fandango twist while a traditional Jewish melody forms the basis of one of the six diverse musical motifs, albeit with an all-new Balkan rhythm and flamenco flourish that resonates around the stage. The ability to play with the audience’s perceptions, creating tension between expectations and reality, serves to highlight the exceptional range of the two artistic directors in their theatrical playground. It is this excitement that has the audience bursting into laughter time and time again throughout the performance. While rehearsals were still under way for the performance in Madrid, Roni Martin became the first non-Spanish musician to be invited onto the jury for the prestigious choreography competition “Certamen de Coreografia de Danza Española y Flamenco” – an incredible accolade and much-deserved recognition for the effort he and his wife Kaari channelled into creating their version of Carmen for the 21st century. For their next project, the pair will be casting their eyes towards their Russian neighbours as expectations and emotions run high once again in their take on Tolstoy’s Anna Karenina.